First, the good news. The shallots are in, and it's a great harvest. You can see in the picture above that they are drying above the chicken coop; after a couple of weeks there, I'll braid them and hang them inside from the Shaker Peg Rail. I usually like to plant French Gray shallots, but couldn't find them this year, so instead planted red - they were prolific. Not as big in the bulb, so to speak, but each clove made 5-6 big onions. So I'm pleased with this harvest. That's it for the garlic harvest. I planted my usual Inchelium Red, and it just didn't take this time. I planted it in three different places, but the main bed of garlic did terribly. The heads are incredibly small and under-formed. I'm so disappointed, I can't even express it. 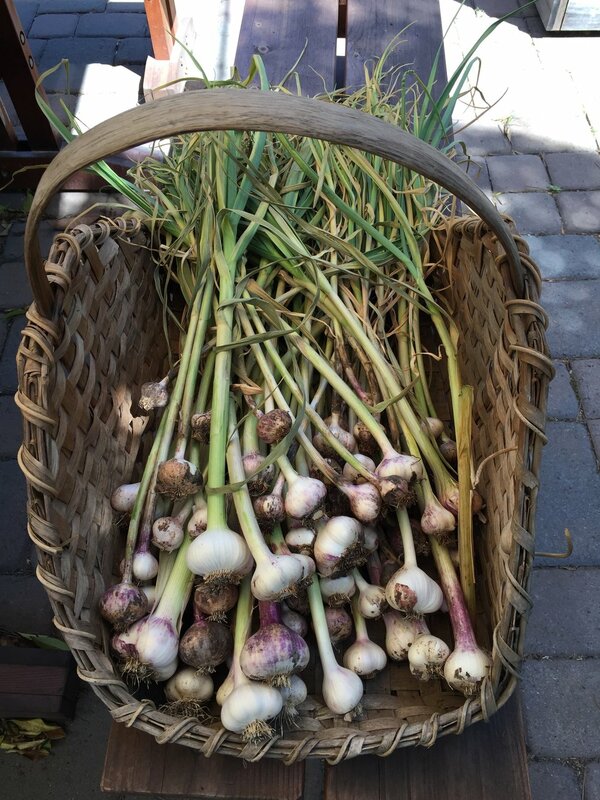 We go through so much garlic every year, and I count on this harvest. Ugh. One thing I found as I was cleaning the garlic of dirt - millions of tiny black aphids. They're all over the green part of the stems, and this could be part of the reason why they didn't do as well as usual. We had a weird, dry winter until March, and then the skies unloaded, but it might have just been too late. I broke up the soil in both the garlic and shallot beds, and they both were compacted and dry. So I added a ton of organic matter to both (homemade compost/chicken manure), some organic granulated fertilizer too, and in one I planted cucumbers and the other has both watermelon and cantaloupe. We'll see how they do. Meanwhile, I was down to our last two heads of garlic from last year, and all the cloves had sprouted and were soft. So I diced it all up, removing the sprout from each clove, and dried them on 125 degrees in my dehydrator and made a little (a very little) garlic powder. It smells heavenly. I took all those bitter sprouts from the garlic cloves and planted them. Maybe they'll root and I'll get a surprise harvest, come Fall.